Every now and again, my graph-nerves get itchy. It feels like I need to get my hands dirty again, and do some playing around with the latest and greatest version of Neo4j. 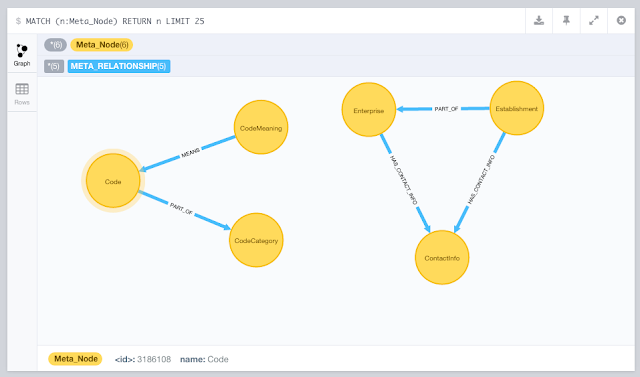 Now that I have a bit of a bitter team in Europe working on making Neo4j the best thing since sliced bread, that seems to become more and kore difficult to find the time to do that – but every now and again I just “get down on it” and take it for another spin. So recently I was thinking about how Neo4j can actually help us with some of the fraud analysis and fraud detection use cases. This one has been getting a lot of attention recently, with the coming out of the Swissleaks papers from the International Consortium of Investigative Journalists (ICIJ). Our friends at Linkurio.us did some amazing work there. And we also have some other users that are doing cool stuff with Neo4j, OpenCorporates to name just one. So I wanted to do something in that “area” and started looking for a cool dataset. I ended up downloading a dataset from the Belgian Ministry of Economics, who run the “Crossroads Database for Corporations” (“Kruispuntbank voor Ondernemingen”, in Dutch – aka as “the KBO”). Turns out that all of the Ministry’s data on corporations is publicly available. 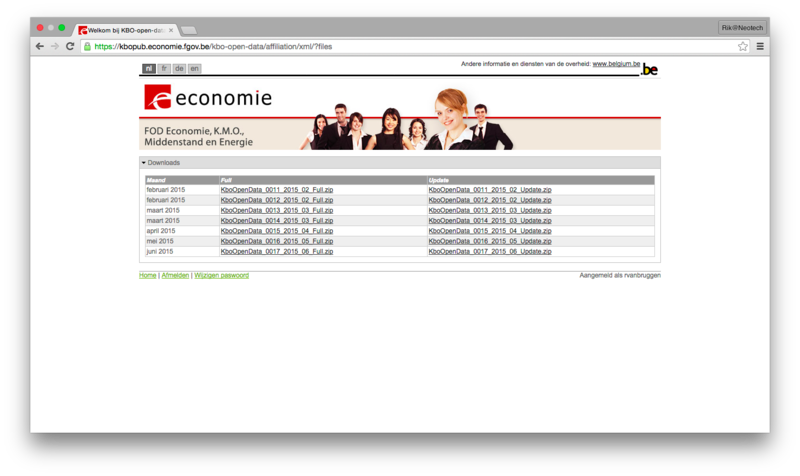 All you need to do is register, and then you can download a ZIP file with all of the publicly registered organisations out there. So you can see that this is a somewhat of a larger dataset. About 22 million CSV lines that would need to get processed – so surely that would require some thinking … So I said “Challenge Accepted” and got going. 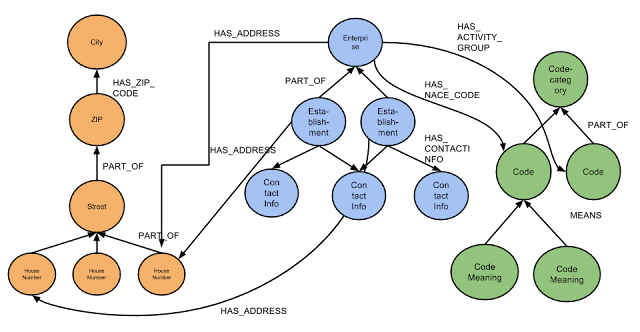 The activitiy types of the organisations in the dataset. The dataset has a lot of data about activity categorisations – definitely something to explore. The addresses/locations of the organisations in the dataset. The thinking would be that I would want to understand interesting clusters of locations where lots of organisations are located. So I created a model that could accommodate that. Here’s what I ended up with. The “orange” hierarchy has all the addresses in Belgium where corporations are located. The “green” hierarchy has the different “Codes” used in the dataset, specifically the activity codes that use the NACE taxonomy. The “blue” hierarchy gives us a view of links between corporations/enterprises and establishments. So there we had it. A sizeable dataset and a pretty much real-world model that is somewhat complicated. Now we could start thinking about the Import operations themselves. In neo4j.properties, I adjusted the cache settings. Caching typically just introduces overhead, and when you are writing to the graph these cache really don’t help at all. So I added cache_type=weak to the configuration file. That’s the preparatory work done. Now onto the actual import job. Note the “with distinct” clause in this is really just geared to make the “merge” operation easier., as we will be ensuring uniqueness before doing the merge. The “periodic commit” allows us to batch update operations together for increased throughput. So then we could continue with the rest of the code.csv file. Note that I am trying to make the import operations as simple as possible on every run – rather than trying to do everything in one go. This is just to make sure that we don’t run out of memory during the operation. As you can see from the screenshot below, this takes a while. If we profile the query that is taking the time, then we see that it’s probably related to the CodeMeaning query – where we add Code-meanings to the bottom of the hierarchy. We see the “evil Eager” pipe come in, where we basically know that Cypher’s natural laziness is being overridden by a transactional integrity concern. It basically needs to pull everything into memory, taking a long time to do – even on this small data-file. Note that I used a nice trick (described in this blogpost) to convert the date information in the csv file to a number. Interestingly, all of this is really fast. Especially if you look at what was happening above with the Code-meanings. The reson for this is of course the fact that we are doing a lot simpler operations here while adding the data. The entire execution time on my little laptop was 7 minutes and 10 seconds to add 3180356 nodes and 1602575 relationshipts. Not bad at all. And unfortunately, it gets worse for adding the HouseNumbers to every street. It still works – but it’s painfully slow. I tried of different things, called the help of a friend, and finally got it to work by replacing “Merge”by “Create Unique”. That operation does a lot less checking on the total pattern that you are adding, and can therefore be more efficient. So oof. That worked. Unfortunately we aren’t done yet. We still need to connect the Enterprises and Establishments to their addresses. And that’s where the proverbial sh*t hit the air rotating device – and when things stopped working. So we needed to address that, and that;s why there will be a part 2 to this blogpost very soon explaining what happened. Hope you already found this useful. As always, comments are very welcome.